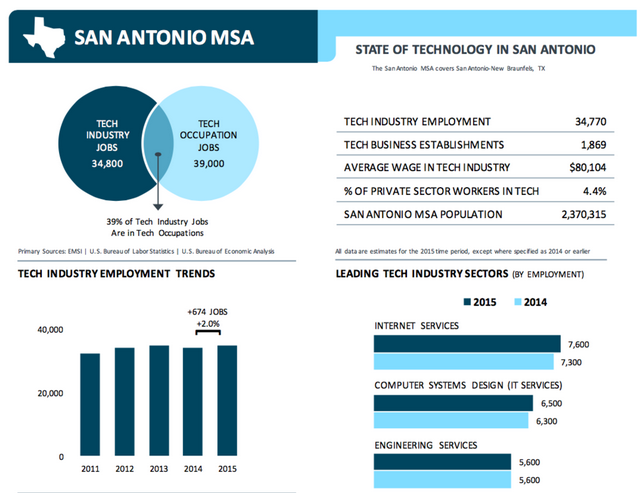 ​SAN ANTONIO - About 670 jobs were added to the market of more than 34,700 workers in the technology industry, according to a report aggregated by the Computing Technology Industry Association. For the Alamo City, that's a 2 percent increase in one year. By comparison, Dallas and Austin's technology sector added 3.3 percent and 3.4 percent respectively during the same time frame. There are about 1,800 tech-centric businesses in the San Antonio-New Braunfels metro area, but technology workers make up only 4.4 percent of private sector employees. Some of the high-growth job specialties in the San Antonio metro area include software developers, which grew about 5 percent to total about 2,700 workers and computer system analysts, which ticked up 4.1 percent from last year to about 3,300 people. In San Antonio, job postings for tech sector careers grew about 43 percent from about 2,800 job offers to 4,100 in fourth quarter 2015 according to data collected by Burning Glass Technologies Labor Insights. Average wages in the tech industry were about $80,100 annually in San Antonio—a $23,000 drop from other Texas cities. In Dallas the tech industry average wage was $105,400 and it's $103,600 in Austin, according to the report.